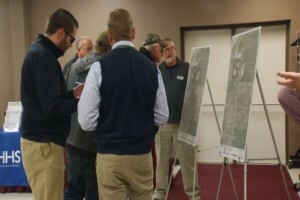 Some Northern Michigan residents are learning about possible groundwater contamination that was caused by fire-fighting techniques used more than 20 years ago. A tire fire broke out back in 1996 at “Carl’s Retreading”, in Grand Traverse County’s Blair Township. The foam sprayed onto the fire contained chemicals known as PFAS, which weren’t known to be hazardous at the time. But contamination concerns came to light last year, and officials have spent much of this year in the testing phase. Water at the site was checked for contamination this spring. And the DEQ will test the groundwater there quarterly over the next two years. Homes to the west are on municipal water, so it’s the homes to the east and southeast they’re concerned about. All of those wells have already been tested, or the tests have been offered to those homeowners. Thorell says if any other property owners in the study area still want their well tested, they can contact the Health Department.